Lee Selby gave Evgeny Gradovich a boxing lesson as he won the IBF world featherweight title by a technical decision in the eighth round. Gradovich was peppered by punches from the skilful Welshman until he was stopped by a gruesome cut by his right eye. As the cut was caused by an accidental clash of heads, Selby was adjudged winner by unanimous scores of 79-73, 80-72 and 79-73. Selby became the 12th Welshman to win a world title, following in the footsteps of Joe Calzaghe, Howard Winstone, Freddie Welsh and Jimmy Wilde among others. It was a sparkling display from Selby, who nullified the aggressive California-based Russian who was making his fifth title defence. Slick Selby's hand speed troubled Gradovich from the first round, including a big left hook, and the Welshman continued his good work in the second. Selby, from Barry, showed off his array of skills in the second round, catching the Russian from a variety of angles. Selby's immaculate work had Gradovich's face marked up and bleeding after four rounds and in the sixth the tough Russian was staggered by a right hand. Gradovich, 28, was stopped in his tracks by a lightening combination early in the seventh and later in the round suffered the horrendous cut by his right eye. With his face covered in blood, Gradovich was stopped in the eighth round after being inspected by the ringside doctor and Selby was ruled winner by unanimous scores. Welshman Lee Selby has a knack of making supposedly tricky and competitive assignments appear utterly simple and straightforward, and this trend continued tonight at London’s O2 Arena as he dominated IBF world featherweight champion Evgeny Gradovich through eight rounds to win a technical decision (scores 80-72, 79-73 and 79-73). The fight, stopped in round eight on account of a cut to Gradovich’s left eye, was deemed a 50-50 affair on paper, but was anything but in reality; Selby was too classy, too comfortable and too clever for the one-dimensional champion. In fact, the only questionable move Selby made all night was his decision to vault the ring post at the bout’s conclusion and do his best Ali impression, complete with boasts of prettiness and greatness and invincibility. Not so fast. A man at the height of confidence, it was in keeping with Selby’s cocksure persona, but his actions, rather than braggadocio and boasts, spoke loudest this evening. Frankly, Selby was that good. From the off he peppered Gradovich with check left hooks – seemingly borrowed from his hero Floyd Mayweather – and stung the champion with jarring uppercuts whenever he dared to lean forward and attempt to invade his space. Gradovich, even early on, had no answer for Selby’s lateral movement, delicate footwork and ability to fire shots from all angles and distances. Instead, he trudged forward behind a high-held guard and forced out clusters of light-hearted punches whenever he got within touching distance. Such was the extent of Selby’s composure, the Barry native seemed happy to let Gradovich step to him and happy even for Gradovich to land the odd punch on his face, head and shoulders. Nothing seemed to fluster him. He’d shake off the shot, ride with it, and then, crucially, come back with something of his own. This meant Gradovich was unable to build up any kind of momentum, let alone grab a foothold in the contest, as time and time again he was punished for his sins. The key to Selby’s dominance, especially early on, was his ability to keep punching while on the move; whether shifting left or right, he was able to run off punches from either hand. Never once did he stop moving, or stop punching, thus eradicating any hope Gradovich had of building up a head of steam; each time he tried to do so Selby would stick his jab, his right hand or a snappy left hook the way of his receding hairline. The 28-year-olds traded back and forth through five rounds, with neither man particularly hurt or in trouble, before Selby finally achieved some sort of a breakthrough in round six, when he staggered Gradovich momentarily with a wild right hand. The shot budged the Russian. It forced him to cover up and re-think his march. It caused Selby to excitedly pursue him. But the finish would have to wait. Gradovich, famously durable, weathered the storm, sucked it up and continued hunting Selby in the seventh. One round later, however, the cut by his right eye, which poured blood and covered his face in claret, was now complemented by a nastier cut to his left eye, one which would bring a premature and anticlimactic end to the bout in round eight. Ali impression aside, Selby, 21-1 (8 KOs), was pretty much faultless in his first world title fight. Gradovich wasn’t Liston, it wasn’t even close to an ‘I shook up the world’ upset, but the gifted Briton thoroughly deserves his moment in the spotlight, the subsequent plaudits and, indeed, his world championship. 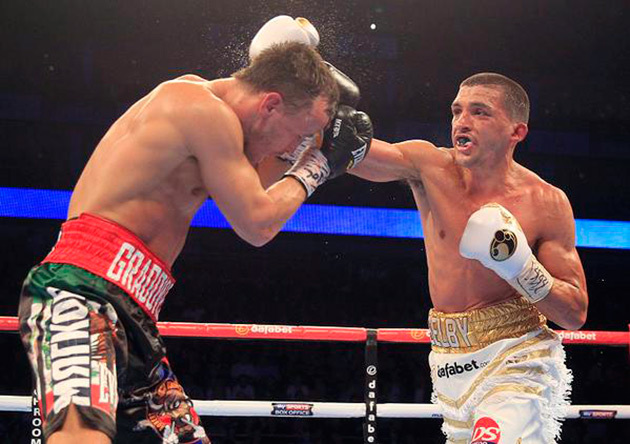 A slow-burning career – one which saw him dawdling anonymously at four- and six-round level for a number of years – has suddenly ignited in the best way possible for Lee Selby. Rumble, young man, rumble.